WABASH, Ind. (WANE) The city of Wabash has beat out 10,000 other small communities in a national competition aimed at helping small businesses. The town of Wabash won $500,000 to help small businesses with marketing, business advice and other improvements. The announcement was made Thursday at a community party at the Eagles Theater at the Honeywell Center. 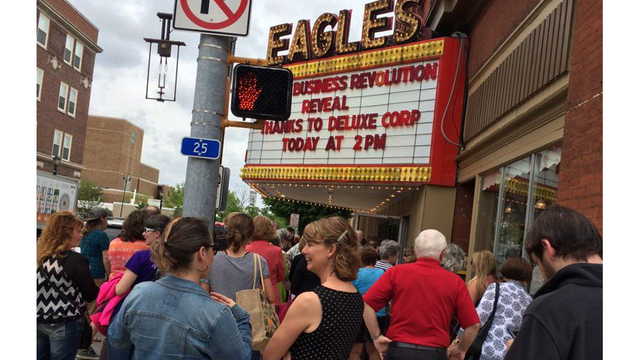 Deluxe Corporation, a small business marketing firm, put on the Small Business Revolution competition. After a national vote, Wabash came out on top, beating other finalist Silverton, Oregon with 180,000 votes. "This is what it's all about. It was never about marketplace or visit Wabash County it was all about our community investing in those families that are investing everything they have into Wabash and I think that's why I was crying just realizing, wow, all these people's dreams can come true," Wabash Marketplace Project Manager Shelby McLaughlin said. The grand prize of $500,000 will be used to help small businesses chosen by Deluxe Corporation with marketing, business advice and other improvements. "Being a small business owner downtown a lot of our daily worries are just how we're going to get through the day and how we're going to get through to the next month and raising our family and things like that, so I didn't know that something like this was possible," small business owner Tracy Griffith said. The city of Wabash got a few celebrities on board to help garner votes. Colts player Patt McAfee and Divergent movie star Shailene Woodley have both tweeted about supporting Wabash in the competition. Deluxe Corporation will follow the transformation of Wabash's small businesses in an online series with Shark Tank's Robert Herjavec.